No Comparisons: The Outsourcers' War on Benchmarking. The gist of the article is that comparing services for the purpose of benchmarking is pretty tough, more art than science. This is where a good service catalog helps so much, because having formal business service definitions allows to understand all the parts. Interesting article in Computer world on "The Seven Deadly Sins of Outsourcing". It's a good read on how outsourcing deals go wrong. Frankly, I think the number of sins is even larger. Two of the sins discussed in the article, "Sloppy Service Levels" and "Feeble governance" are directly linked to IT Service Catalogs. The Service Catalog is a key enabler for outsourcing relationships because it clarifies the service definitions, levels, cost and the how to get those services. Here's a quote on governance from the article. Before you sign with an outsourcer, nail down an organizational structure, establish methods for keeping tabs on the work being done, and spell out how you will manage the outsourced project on a day-to-day basis. "Your governance system should provide continual feedback to the organization regarding how the relationship is working, what value you are getting, how you are solving problems that have cropped up," says Michael F. Corbett, executive director of the International Association of Outsourcing Professionals in LaGrangeville, N.Y. It's impossible to do day to day governance on thousand of interactions happening between employees and the outsourcer. And "governance" adds even more touch points to the service request cycle, adding overhead costs, reducing response and delivery times, and increasing the points of failure. At one company, we counted 23 people and 5 different approval levels, spread across three organizations, to get a PC. Things were bad. How bad? The users had hired another outsourcer to just shepherd the processes between the different organizations and companies involved! At newScale, we have worked with a number of large outsourcers and customers to bring a service catalog and service request system to help manage the relationship. 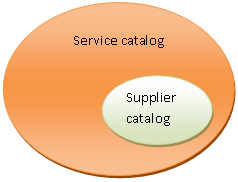 The catalog defines the services available, the entitlements, the authorization structures and service level objectives. When a customer needs something, the catalog service request gets the order placed, forms filled, automatically gathers signature, and through e-commerce interfaces directly with the outsourcer's system. The catalog enables metrics to be gathered and controls to execute without massive overhead. We are seeing two encouraging trends: First, users demanding of their outsourcer that a catalog service request system be part of the contract, and outsourcers writing in their contracts that they will provide a catalog based, self-service request system as part of their transformation. The customers demanding a service request catalog because the old way of getting stuff is going away: the forms, the help desk, the personal friendship, the informal network--all disappear. And you can't replace it with a 500 page contract and expect every employee to read every clause just to get new PC! So they need a on-line, catalog-based service request that is specific to the organization and the contract. The customers who are demanding this capability tend to have experience in outsourcing and have seen the problems a lack of clarity create. 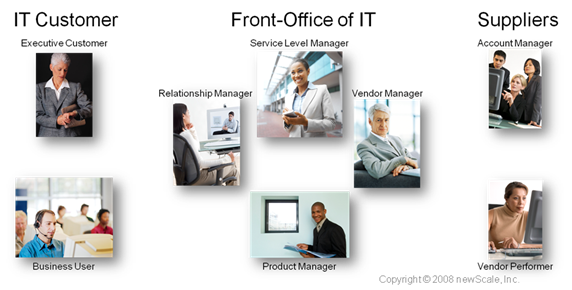 For the outsourcer, believe it or not, they need to show they are meeting service levels, restrict the services to only those the customer is paying for, and take costs out of the overhead -- which can only be done if services are standardized, published and integrated with back end provisioning. "The average cost to manage an outsourcing contract is 3% to 6% of the size of the contract, according to Julie Giera, an analyst at Forrester Research Inc. in Cambridge, Mass." 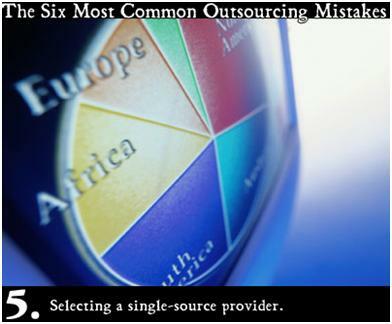 This article in CIO.com on outsourcing strategies does a good job outlining different models. It also goes into the cause for failure of outsourcing. And there are a lot reasons for failure, but mostly I find it's the lack of "meaningful" clarity about service expectations. Writing 500 page contracts does not make things clearer to anyone except expensive attorneys. This is why a service catalog can play a crucial role by clarifying to end-users and executives which services have been agreed to, what is included, what price, how to get them, and under what quality conditions.